OK, let’s get the name out the way first. It’s ‘6’ for 6-Series (Rapido’s entry-level range) and ‘66’ is their code for single beds. 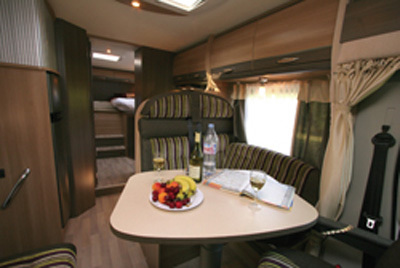 This motorhome simply plugs an obvious omission in the 6-Series low-profile line, which already included French bed, island bed and garage models, as well as one with a drop-down bed over the lounge. As for the layout, it’s a continental favourite, but one that’s not repeated in the Rapido range until you get to the much more expensive 9066dF A-class. 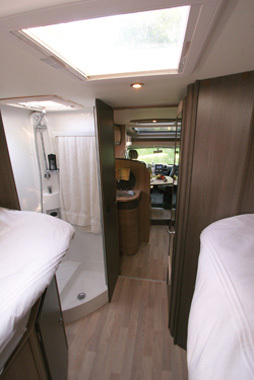 The firm’s only other single bed low-profile is the new 7066 with low-level beds forward of an across-the-rear washroom. Here, the single beds are raised up to create a proper garage beneath, while the ablutions facilities are split – shower on the left, toilet and washbasin on the right – with a sliding door to shut off the whole bedroom/washroom shebang. It’s this aft portion of the layout that will sell you the 666 (or not), while the bow contains the predictable European-style lounge around a permanent table and the L-shaped kitchen and fridge/freezer are centrally sited. The shower room isn’t particularly generous, mainly because of its almost triangular shape and a little wheelarch intrusion. Opposite, the L-shaped galley comes with a three-burner hob (with split glass lid to preserve worktop space when you’re not using all three rings) and a Baraldi extractor hood (the sort of touch that is a nice surprise at this price level). 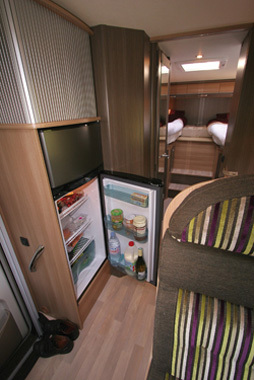 You also get a 146-litre fridge/freezer. British buyers will get as standard equipment the usual Smev combined unit fitted below the hob. While the forward lounge may not be the biggest, it certainly tries to make up for that with lots of daylight to make the most of the space provided. 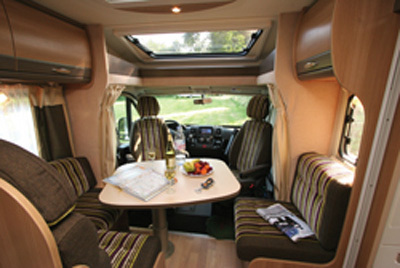 And while many European motorhomes use a half-dinette, Rapido favour an L-settee for a more sociable seating plan. The table is big and you can’t remove it, but like all 2012 Rapido tables it slides backwards, forwards, sideways and rotates. It’s easily big enough for four to dine around. Up above there’s not just a giant Remis wind-up rooflight, but an opening overcab sunroof too. And Rapido also fit an extra window behind the single offside inward-facing seat. The Rapido really does impress with its details. Not only are there cab blinds, but thick, near-floor-length curtains to create a more homely evening environment (and in the winter, a warmer one too). And you can listen to the after-market Pioneer stereo for as long as you like as it’s wired not through the ignition but via its own dashboard master switch. 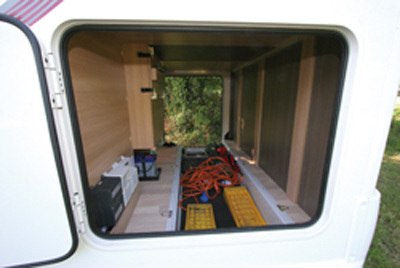 Of course, there are three-points seatbelts for a pair of rear passengers too, but the gas locker does intrude into foot room for the fourth person. 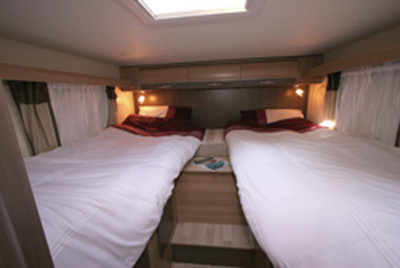 As much as this motorhome is about single bed sleeping, it’s also about having room for bikes on board. Maximum loading weight in the garage is 150kg, while overall a standard 666 offers around 500kg payload (plenty for most owners), but can be increased by a further 150kg at no extra cost if your licence allows you to go beyond 3.5 tonnes gross weight. 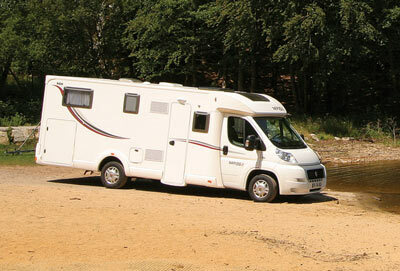 Due to the value of the motorhome owners are likely to invest in extra security. 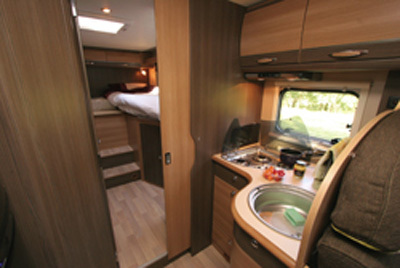 Caravan Guard would need owners of this motorhome to fit a Thatcham Category 1 approved alarm system. This Rapido looked and felt every bit as well put together as we’ve come to expect from the company’s more expensive motorhomes. 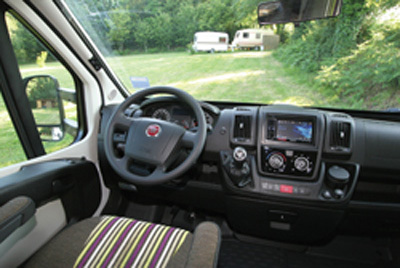 Motorhome insurance premium based on 2011 Rapido 666 valued at £49,600. will it carry a motor cycle ? 2) Is automatic transmission available. it suggests that different upholstery fabrics are available. The base vehicle is a Fiat with a 2.3TD engine. I haven’t yet found any information to suggest the motorhome is available in automatic transmission but have asked one of our experts to do some more digging.